Hi-larious! A little cheesy for our dear old Mr Pegg, but everything he touches turns to gold and how can you not cheer on the beer-bellied, but loveable fool as he attempts to win the heart of the WAY out of his league ex! 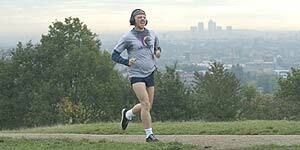 Still lagging behind Shaun of the Dead - but then I wonder if he'll ever live up to such greatness? This wasn't as funny as Hot Fuzz but it was still pretty good, although the shot of Simon Pegg in hotpants is going to be burned in my mind for all eternity (and not in a good way).